Extreme thirst, rapid and sudden weight loss, and frequent urination are all possible signs of type 1 diabetes, once known as juvenile diabetes. In the United States, approximately 1.25 million children and adults have type 1 diabetes. It is important you recognize the signs and symptoms of this condition and know how it can be managed. Type 1 diabetes is an autoimmune disease. Your child's pancreas stops producing insulin, a hormone that helps get energy from food. This happens when the body's immune system attacks and destroys the beta cells that produce insulin in the pancreas. Research suggests there are genetic factors and environmental triggers that cause this to happen. There is nothing you can do to prevent your child from getting type 1 diabetes and currently, there is nothing you can do to get rid of it. Family history: If a parent or sibling has type 1 diabetes, your child has a slightly greater risk of developing the condition. Genetics: When certain genes are present in your child's body, the risk of developing type 1 diabetes is greater. Geography: Type 1 diabetes is more prevalent in individuals that live farther away from the equator. Age: Type 1 diabetes happens most often in children and young adults, but it can appear at any age. There are, however, two periods during childhood when the condition tends to peak. The first occurs in children between ages 4 and 7 years old, and the second is in children between 10 and 14 years old. Lethargy, heavy breathing, and nausea or vomiting are also signs of type 1 diabetes. If you are at all concerned your child is showing sign or symptoms of this condition, it's important you schedule an appointment as soon as possible. When untreated, this diabetes can be life-threatening. Childhood diabetes is generally diagnosed using the glycated hemoglobin (A1C) test. This is a blood test that indicates the average blood sugar over the past 2 to 3 months. It measures the percentage of blood sugar attached to the hemoglobin, an oxygen-carrying protein in red blood cells. A high blood sugar count indicates more sugar is attached to the hemoglobin. An A1C reading of 6.5 percent or higher on two separate tests signifies diabetes. Currently, juvenile diabetes has no cure. Your child's healthcare provider will focus on managing blood sugar levels with insulin, encouraging eating a balanced diet, and promoting an active lifestyle to prevent complications. As a parent, your overall goal is to help your child keep their blood sugar as close to normal as possible to prevent any potential complications. Your child will check his or her blood sugar level four or more times each day with a blood glucose meter. UptoDate, an evidence-based clinical decision support resource which requires registration, suggests having your healthcare team teach your child how to operate the meter and perform A1C blood tests regularly to check the average levels of blood glucose over the past 3 months. Regular checks of blood sugar levels and A1C results will help the healthcare team determine if their diabetes is being well-controlled or if any adjustments need to be made to their treatment plan. Beta cells in the pancreas produce the hormone insulin. After each meal, beta cells release insulin to help use or store the blood glucose obtained from food. With type 1 diabetes, your child's pancreas no longer makes insulin, so he or she will depend on insulin shots to use up the glucose from their meals. Short-acting (regular) insulin usually reaches the bloodstream within 30 minutes after injection. This medication peaks anywhere from 2 to 3 hours after injection and is effective for approximately 3 to 6 hours. Rapid-acting insulin begins working about 15 minutes after injection, peaks in about 1 hour, and continues to work for 2 to 4 hours. Intermediate-acting insulin normally reaches the bloodstream about 2 to 4 hours post-injection, peaks 4 to 12 hours later, and is effective for about 12 to 18 hours. Long-acting insulin will reach the bloodstream several hours after injection. It lowers glucose levels evenly over a 24-hour period. Your healthcare team will select the correct therapies depending on specific goals and outcomes. If you're having trouble managing your child's blood sugar or you have questions, don't hesitate to contact the healthcare team. It is important your child's diet is filled with food that is high in vitamins and minerals while limiting foods high in fat, sugar, or empty carbohydrates. Your healthcare team including a registered dietitian or certified diabetes educator will help calculate your child's exact insulin needs to support their carbohydrate intake and avoid blood sugar highs and lows. Choose fresh or frozen fruits and opting for citrus fruits such as oranges and grapefruit when possible. Fruits have natural sugars and should be counted as carbohydrates if your child is using a diet plan. Some vegetables such as potatoes, corn, and peas have more carbohydrates than other vegetables and should be eaten in moderation and accounted for when calculating carbohydrate intake. Non-starchy vegetables, such as asparagus, celery, kale and cucumbers, have less of an impact on your blood sugar. It is recommended that your child eat at least 50 percent whole grains. Brown rice, bran cereal, and whole grain bread are great sources. Your child should eat fewer refined carbohydrates such as white bread and sweets. Experts recommend you limit your child's intake of processed fatty meat, which contains higher levels of saturated fat and sodium. Good protein sources include meat, beans, and eggs. Your child's diet should also include heathy fats such as avocado, nuts, and seeds. Children and adolescents with type 1 diabetes should adhere to the CDC and American Academy of Sports Medicine recommendations for a minimum of 30 to 60 minutes of moderate physical activity daily. Monitor your child's blood glucose levels before they exercise. Consume approximately 15 grams of carbohydrates before exercise if blood glucose levels below the target range. When participation in vigorous activity is expected to be greater than 30 minutes, an additional 15 grams of carbohydrate may be necessary. Check with your healthcare provider for your child's suggested amount. If your child is participating in prolonged vigorous exercise, they should have their glucose monitored during the exercise and after exercise to guide their carbohydrate intake and to adjust any insulin dose for frequent exercise events. At the beginning of a new sports season, it is ideal to monitor your child's blood glucose frequently during the 12 hours after exercise to guide any insulin dose adjustments that may be needed. Physical activity should be encouraged in children particularly if they are overweight or obese. Sedentary activity should be discouraged. Young children are unable to provide their own diabetes care, and middle school and high school students should not be expected to manage their condition on their own while at school. You should communicate with school officials about your child's condition and help them develop a plan of care. It is also important for family and friends to recognize signs of low and high blood sugar so they can act fast and respond appropriately. To ensure adequate management of your child's diabetes while at school, staff must be knowledgeable about diabetes care issues and provide an environment that encourages exceptional diabetes management. Your first step should be to work with the school to have a formal diabetes care plan put in place. Sample plans can be found online. These plans not only explain your child's condition but also prepares staff to respond to emergency situations. Low blood sugar emergencies are conditions characterized by abnormally low blood glucose levels causing headaches, sleepiness, unconsciousness, or seizures. Consume 15 to 20 grams of glucose or simple carbohydrates such as, 1 tablespoon of sugar or, 8 ounces of nonfat or 1% milk. Recheck their blood glucose after 15 minutes. If their hypoglycemia persists, repeat the steps above. Once their blood glucose returns to normal, have them eat a small snack if their next planned meal or snack is more than an hour or two away. Injectable glucagon kits are used to treat someone with diabetes that has become unconscious from a severe insulin reaction. The medication helps the liver to release stored glucose into the bloodstream when blood glucose levels are too low. Glucagon kits are available by prescription. Speak with your healthcare provider about whether you should buy one, and how and when to use it. Friends, family, and neighbors should be instructed on how to administer glucagon to treat severe hypoglycemic events. If they are unsure about the situation have them call 911. Your child may also experience drowsiness, exhaustion, nausea or vomiting, fruity or sweet smelling breath with their high blood sugar. Having high blood glucose levels for long periods can lead to diabetic ketoacidosis (DKA) where toxic acids build up in the blood and urine and can lead to diabetic coma. Get help right away and contact your child's healthcare provider if he or she is experiencing any of these signs or symptoms. Managing your child's chronic condition may feel confusing and overwhelming but you don't have to do it alone. There are many resources available online to help guide you through this process. The JDRF offers information and resources about type 1 diabetes. American Diabetes Association provides a number of resources including online forums, research initiatives, and advocacy efforts. 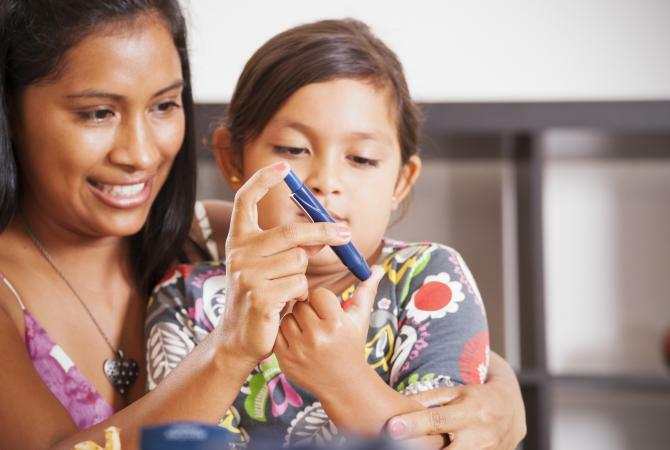 Having type 1 diabetes should not limit your child's ability to achieve planned goals. Children with type 1 diabetes can go on to live healthy and productive lives through medication management, participation in regular physical activity, and nutrition management.